Pools or other water features in your home landscape space is one of the most desirable features for entertaining friends and family. Any feature involving water is also one of the more complicated aspects of a residential or commercial landscape design so it is critical that it be designed and installed correctly. The most common form of water in a yard space is a pool to keep the kids cool and happy during the summer. 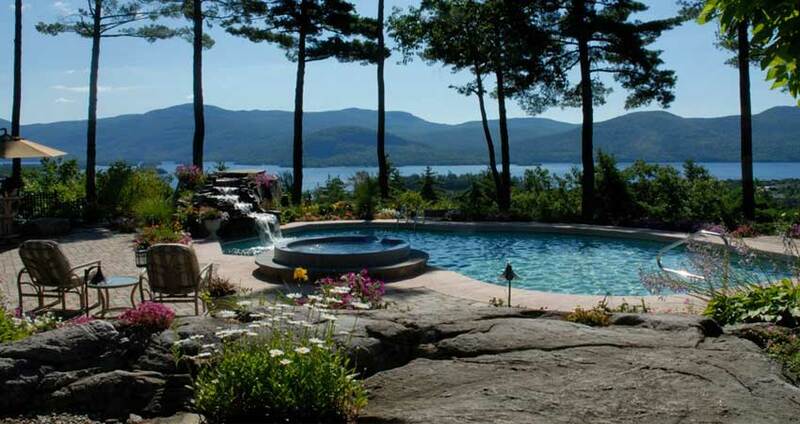 Homeowners often overlook all that is involved with the installation of custom pools. For example, setting a pool at the right elevation is crucial for proper drainage, especially for the surrounding patios. Fences that meet state and local code are required, as well as electric and gas hook-ups, pool equipment placement and camouflaging. 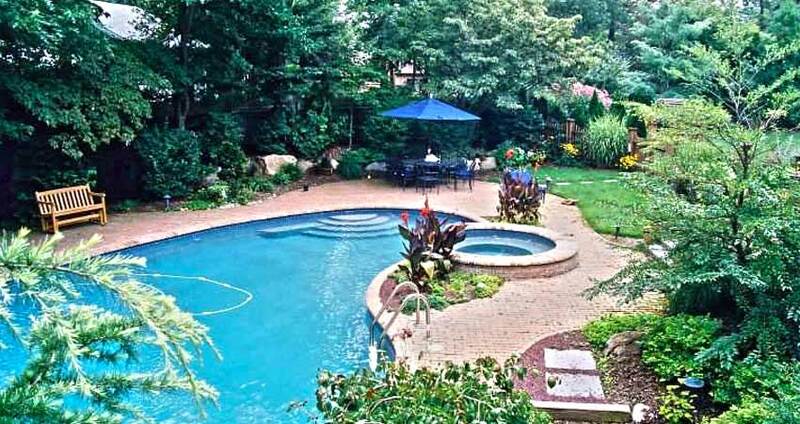 The surprise for most homeowners comes when the cost to “finish” the pool with all these details, many of which are not optional but required, increases the total project budget to sometimes double or even triple what the pool company quotes them. Redbud can provide you with a creative and functional landscape design plan, a realistic budget and the highest quality installation so that you are confident that your outdoor space is built correctly and is sure to endure. But the sight, sound and sensation of water is very attractive to people of all ages so your water feature can come in many different varieties. A swim spa or hot tub can be used for pleasure or as a therapeutic aid; the best part is, they can be used all year long, even here in the Northeast. A proper plan can ensure that your home spa is located in a private setting, designed for easy access and linked to your home heating system for efficiency and easy maintenance. 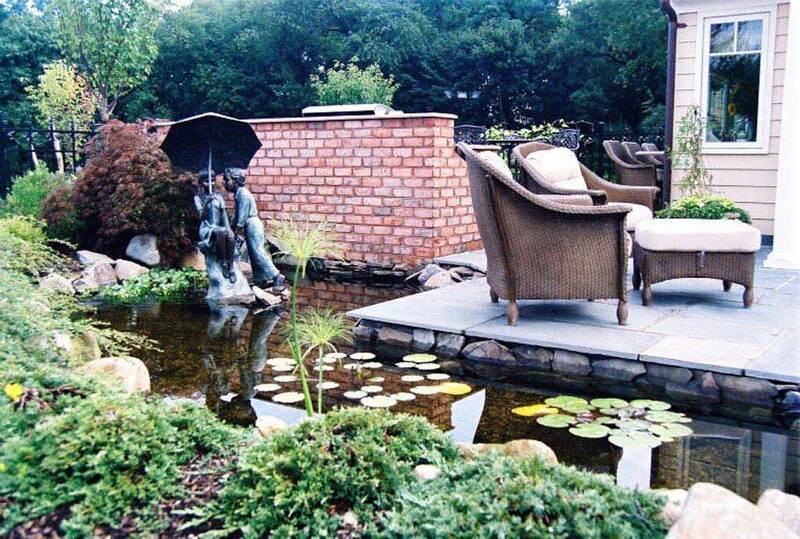 Other kinds of landscape water features can be included in your landscape design more for esthetics, such as a man-made pond, koi pond or a nature-inspired waterfall. Landscape water features can also come in the form of a classic water fountain, or even as part of a whimsical statue or piece artwork strategically placed in your home entertaining space.